Welcome Comicpalooza attendees. Below are some resources related to our talk. Also, check the Resources menu above to discover more — like homeschool laws, websites & blogs, books, videos, conferences, unschooling groups, and more. 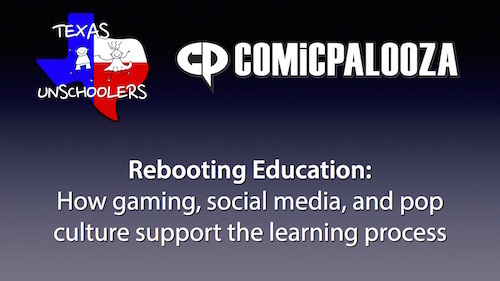 We did a panel talk titled “Rebooting Education: How gaming, social media, and pop culture support the learning process.” The slides from that presentation can be downloaded here (12 MB PDF). A little 4½ minute video we made. Highly recommended video, recorded at our 2015 Texas Unschoolers Conference — Dr. Gray relates the anthropological research that shows how children, throughout history and across all cultures, have thrived by self-educating through play to learn the skills required for survival in their culture. Also, see Peter Gray’s blog at Psychology Today called Freedom to Learn and his Alternatives to School website. Sugata Mitra talks about his Hole in the Wall project. Young kids in this project figured out how to use a PC on their own — and then taught other kids. He asks, what else can children teach themselves? While one widely held view maintains playing video games is intellectually lazy, such play actually may strengthen a range of cognitive skills such as spatial navigation, reasoning, memory and perception, according to several studies reviewed in the article. A new study assessed the association between the amount of time spent playing video games and children’s mental health and cognitive and social skills, and found that playing video games may have positive effects on young children. Stay current on news and blog posts by subscribing to the TexUns Newsletter. Click here to sign up. You can easily unsubscribe at any time, and your email will never be shared with anyone.